206 pages | 46 B/W Illus. 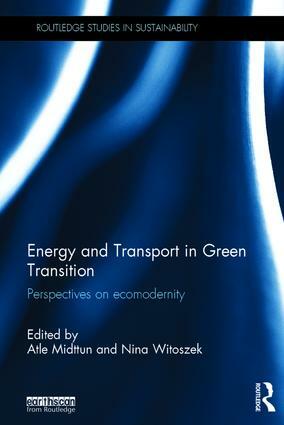 This book breaks new ground in the studies of green transition. It frames the ongoing transformation in terms of a "battle of modernities" with the emerging vision of ecomodernity as the final destination. It also offers a systematic exploration of the potential for extensive transformation of carbon-intensive sectors – with a focus on energy and transport – towards a low or post-carbon economy. The book does so in a comparative perspective, by pointing to a diversity of techno-economic and institutional solutions in the mature Western economies, and in the rapidly growing East and developing South. The contributors highlight a broad spectrum of available alternatives as well as illuminate conflicting interests involved. They also demonstrate how solutions to the climate challenge require parallel technological and governance innovation. The book advocates a new, overarching vision and agenda of ecomodernity – based on a synergistic paradigm-shift in industry, politics and culture – to trigger and sustain the ecological innovation necessary to tip development in a green direction. This vision cannot be monolithic; rather, it should reflect the diverse interests and conditions of the global population. This book is aimed at researchers and postgraduate students of energy, transport, environmental and climate policies, as well as development, environment, innovation and sustainability. Atle Midttun is Professor at the Norwegian School of Management, Institute of Innovation and Economic Organisation, Director of the Centre for Corporate Responsibility, and Co-director of the Centre for Energy and Environment. Nina Witoszek is Research Professor at the Centre for Development and the Environment at the University of Oslo. Prior to joining the University of Oslo she lectured at the University of Oxford, the National University of Ireland in Galway, and the European University in Florence, Italy. Sustainability has become one of the most pressing social, environmental, economic, cultural and political issues of our times. Yet the meaning of ‘sustainability’ remains elusive. This series provides original insights from across the social sciences and humanities on the meaning and practice of sustainability. It offers both theoretical and practical analysis of ‘sustainability’, including social sustainability, sustainable consumption, democratic sustainability and sustainable behaviour. These interdisciplinary books give students, researchers, policy makers and practitioners the latest thinking from international authors. This thought-provoking series draws on and is relevant to those working in a wide-range of disciplines, including environment, development, sociology, politics, philosophy, business and marketing, media, geography, and anthropology. To submit proposals, please contact the Editor, Rebecca Brennan (Rebecca.Brennan@tandf.co.uk). Watch editors Atle Midttun and Nina Witoszek discuss their book in this interview with Paddy Coulter from Oxford Global Media.